Catania passenger and car ferry ticket prices, timetables, ticket reservations and information for ferries sailing from Catania to Civitavecchia, Malta and Salerno. Compare all available Catania ferry ticket prices in real time and book the cheapest available Catania car and passenger ferry tickets sailing to and from Catania, Civitavecchia, Malta and Salerno with Grimaldi Ferry Lines ferries online with instant confirmation. Book Catania Ferry Tickets with Grimaldi Ferry Lines for ferries sailing from Catania to Civitavecchia, Malta and Salerno online in advance to enjoy the cheapest available ferry ticket price. The price you see is the price you pay. There are no hidden extras or surprises such as added fuel surcharges or booking fees and we do not charge you anything extra for paying with a Visa Electron card. The price we quote you for your selected Catania passenger or car ferry ticket, onboard accommodation and vehicle type is all you will pay, and that's a promise. To obtain a Catania ferry ticket price and book your ferry ticket securely online please use the real time ferry booking form on the left. You are also able to add a hotel at your destination, or anywhere else, to your ferry ticket when completing your ferry ticket reservation. Catania is located on the eastern coast of Sicily in Italy and is the second largest city in Sicily. Catania is a major transport hub, university center and economic hub in the area and is known for its active nightlife and vibrant culture. The name Catania derives from the Sicilian term Katane, that means "flaying knife, grater" because the city rises over a bristling lava stone land. Catania is also known for its architecture which is mostly Baroque and urban style due to the major devastation that it faced in the earthquake of 1693. Catania attracts thousands of tourists from around Italy as well as other countries through the world. Catania is a true city of the volcano. Much of it is constructed from the lava that poured down the mountain and engulfed the city in the 1669 eruption in which nearly 12,000 people lost their lives. Piazza Del Duomo is the main Plaza in Catania and the center point for all activities. The plaza has a giant elephant statue which has become the symbol of the city in the last few decades. The Plaza is a great place to just sit and relax and watch the people passing by. The plaza is surrounded by a lot of historic buildings and important monuments. Via Etnea is the main shopping destination in Catania and is lined with shops selling numerous types of local as well as branded merchandise. The street also has lots of churches as well as imposing buildings, some of which are architectural wonders. Locals like to stroll around the street at a leisurely pace in the evenings and so it is a good place for people watching. This is an opera house built in the 19th century and is located on Piazza Teatro. The Piazza is a favorite place for the younger crowds to meet and remains lively and bustling till late hours in the night. The opera house itself is quite imposing and has beautiful architecture. Piazza Stesicoro is a lively Square that has the ancient ruins of the Roman amphitheater. The piazza is also where the main market in Catania is located; the main market is lively and colorful and is the place where the locals shop for their everyday needs. The main bus center of Catania is also located here. The renowned fish and food market is located just above the Piazza Del Duomo and is known to be the best fish market in Sicily, the market remains busy at all times of the day and sells exotic items and fish food, a great place to experience the local lifestyle. This imposing building used to house the biggest monastery in Europe at one time. The monastery is no more functioning but the building is now used by the University of Catania, which is the oldest university in Sicily. Mount Etna is the biggest volcano in Europe, and is a must visit. There are several guided and organized tours in Catania that take tourists to the Volcano and the views offered from the top of the mountain are spectacular. The most outstanding monuments are the Chiesa di S. Nicolò and the annexed homonymous Benedictine Monastery (that today is the residence of the Facoltà di Lettere e Filosofia- Faculty of Letters and Philosophy), both of the XVII century, the Chiesa di S. Giuliano erected in the XVIII century, symbol of Catania's baroque, the Chiesa di S. Maria di Gesù of the XV century preserving a marvelous table by De Chirico (1525), the Cathedral that goes back to 1078, that preserves various tombs of Aragonese kings, and the chapel of S. Agata, the city's patron saint. Architecturally outstanding are the Castello Ursino erected in 1239, today host of the Civico museum and of the Picture Gallery, the Belliniano museum set in the residence of Vincenzo Bellini, the Roman amphitheater of the Augustan era, and the home where the writer Giovanni Verga was born, currently seat of his personal museum. There are plenty of locations in Catania to do shopping. The famous Via Etnea is the main shopping destination in the city; the street is lined with several shops where visitors can find almost anything, local as well as branded items. Apart from Via Etnea the main market located near Piazza Stesicoro is also worth a visit. The main market is a typical Sicilian market with narrow winding streets and tiny shops selling trinkets and items that are made locally. The colorful market remains vibrant at all times and most of the locals do their daily shopping from here. Best Price Guarantee - We always offer you our lowest available Grimaldi Ferry Lines passenger and car ferries ticket price to and from Catania. There are no hidden extras or surprises such as added fuel surcharges or booking fees and we also we do not charge you anything extra for paying with a Visa Electron card. The price we quote for your selected Catania ferry ticket, onboard accommodation and vehicle type is all you will pay, and that's a promise! In the unlikely event you find the same all inclusive Catania ferry ticket cheaper in the brochure of any other tour operator we promise that we will do our best to beat that price or offer you the choice of requesting a refund. To book Catania car and passenger ferry tickets please click here. 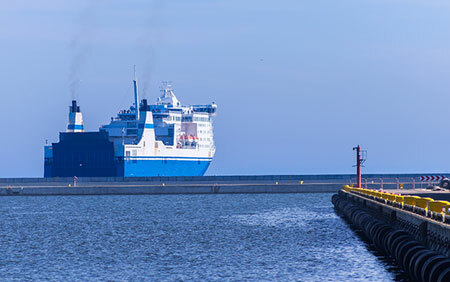 At ferryto.co.uk you are able to obtain live Catania ferry ticket prices, check availability and book car and passenger ferry tickets to and from Catania at our lowest available ticket price. Ferryto.co.uk is part of the world's largest online ferry ticket distribution network providing the ability to book over 80 major European ferry operators including to Catania and to over 1,200 other ferry routes throughout the UK, France, Spain, Ireland, Holland, Eastern Europe, the Mediterranean, the Baltic and North Africa.